DOCTOR WHO Dalek Week - Resurrection Of The Daleks resurrected | Warped Factor - Words in the Key of Geek. 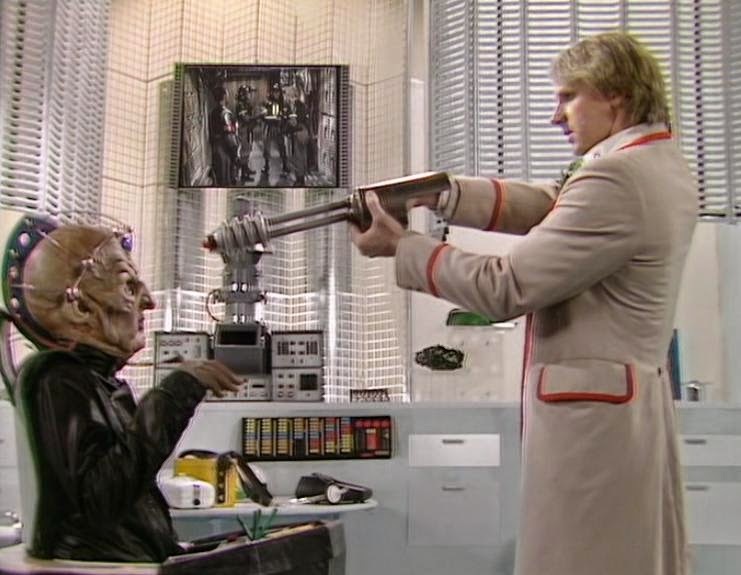 Andrew Jero shows some love for the Fifth Doctor's only Dalek encounter, 1984's Resurrection of the Daleks. As far as Dalek stories in the 1980's go, none of them are quite as good as Resurrection of the Daleks. While Revelation and Remembrance may be GOOD stories they aren't quite of the same caliber as Resurrection. Outside of the 1960's, the Daleks are truly menacing twice. In Genesis they get to be fantastically horrifying. But in Resurrection, they really get to go all out. Kill everyone. 58 on screen deaths! 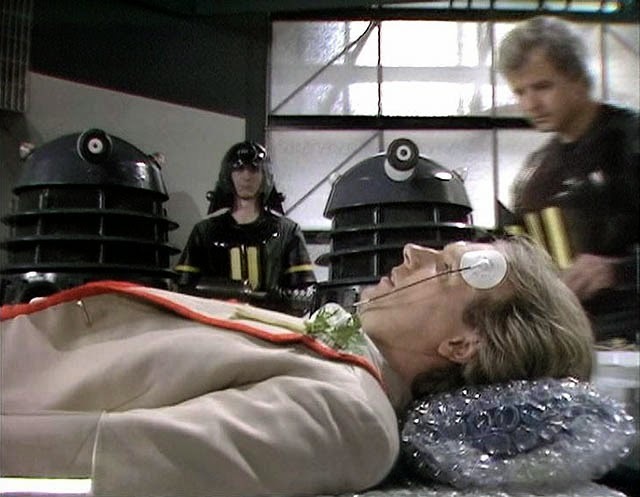 When you take into consideration that Resurrection of the Daleks has more on screen deaths than The Terminator (1984), a movie which sees an entire police station slaughtered, it is truly a testament to the writing abilities of the brilliant Eric Saward! With almost every death we see, we, as an audience, know that it's either some random individual that dies for no good reason, or a character that we've spent the last 100 minutes following. Building attachments with the characters really hurts when we see their demise. Colonel Archer is one that I grew to admire. When we see him go to the policemen and ask for the radio with the "... It's dead." The gun to his head is their way of saying, "so are you." Perhaps the two most painful deaths are those of the man shot at the end of the opening sequence after witnessing the deaths of six alien people just for being there. The other is once the policemen corner Tegan, one raises his gun and shoots a random stranger because she escaped. She feels as if she caused his death, this a perhaps the biggest thing that contributes to her departure at the end of the story. Peter Davison is on top form here, with the "I wouldn't know what to do with an army" scene being one of his best. He is prepared to drop his morals to stop the Daleks, to kill Davros. He truly is THE Doctor here. The Daleks bring out the violent and reckless side of the Doctor which provides some great internal conflict for the companions. Tegan, who had been with the show since Logopolis, has stayed with the Fifth Doctor his entire life. They have a very strong friendship, one that isn't easily broken. It's 58 deaths, the complete massacre they witness that drives her away from him. The violence, the immense number of innocent people that are killed just because of the Daleks' presence, that pushes them apart. "It's stopped being fun Doctor." Still suffering the loss of Adric, Nyssa's departure, and now the loss of Tegan, the Fifth Doctor's era begins to unravel itself with only Turlough and Kamelion remaining. As far as 80's Dalek stories go, Resurrection of the Daleks is the definitive one for me. It shows the Daleks at their most menacing, their most destructive.